The elusive "perfect travel outfit"—it's something we've discussed, debated, and broken down quite a bit before. What does an effortless yet polished and, above all else, comfy travel outfit really look like, and why does it seem nearly impossible to accomplish? Non-stretch, high-rise jeans are out of the question, no matter how long you're traveling for. On the other hand, it's this writer's opinion that wearing straight-up leggings isn't the most stylish option, though I'll admit it may be the comfiest. After countless flights and thousands of miles flown, I think I've finally found the answer to the travel outfit conundrum: knit sets. The matching sweater-and-pants sets just might be the stylish solution to all those times you wore sweatpants but ended up feeling less than put-together upon arrival. With so many fun, colorful sets to choose from right now, there's no reason not to feel ultra comfy whether or not you're traveling (they make pretty great loungewear, too). We love them styled with simple white sneakers and a few dainty jewelry staples. From rainbow stripes to cheery colors and clean neutrals, shop the coolest knit sets below. Infuse your travel outfit with cheery colors and rainbow stripes. PSA: Bella Hadid's worn these. The prettiest track pants maybe ever. 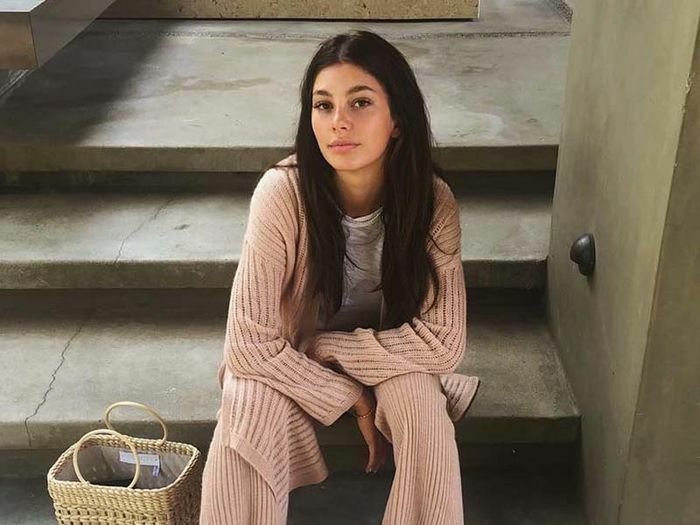 Camila Morrone's got the right idea. Wear your set with a simple T-shirt, white sneakers, and a tote bag. This looks like the coziest sweater in the world. Wear these alone with a T-shirt, too. This rust color is perfect for right now. Choose a cropped hem for warmer days. Look for pretty details like lettuce edges to elevate the overall vibe. Think of all the layering possibilities with this top! Look closely—these are subtly metallic. Fun colors and quirky patterns make these loungewear sets feel fresh. We'd also wear this top with jeans. Fun prints for the win. This set's called "Sunday." Just saying. I think we just found the perfect summer travel outfit. Cardigans are always a good idea. This color looks great with white sneakers. Now you're all set to look stylish en route to your next destination.